Your nonprofit annual report is your chance to show all of your powerful accomplishments from this past year. The challenge for many organizations, however, is to create a publication that engages and inspires readers from start to finish. Organizations spend tons of time and energy collecting and presenting important information, but many annual reports wind up so long and text-heavy that supporters don’t absorb key takeaways. To ensure that readers digest your report, you need to be thoughtful in the way you present it. Craft your next issue with your reader in mind. Here are three ways to ensure your nonprofit annual report appeals to your supporters. Many organizations print and send off their nonprofit annual report. Instead of delivering paper versions to your entire donor base, consider sending them only to those donors who engage with you primarily through direct mail. Feature the online version on your website and email it to the rest of your base. This not only cuts printing costs, but improves transparency by making the annual report available to any site visitor. When you create an online nonprofit annual report, you also have the freedom to make it as interactive and engaging as possible. You’re no longer restricted to paper pages; you can use web design tools to create a beautiful experience for supporters. 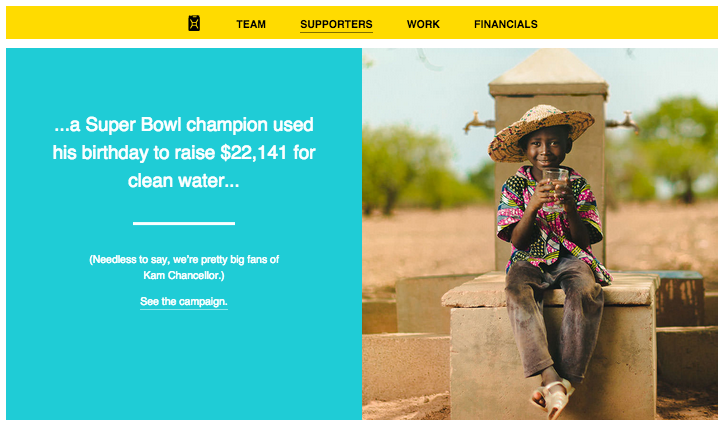 charity:water, for instance, created a dynamic webpage displaying their 2014 annual report and achievements. As you scroll down the page, each frame displays an accomplishment alongside a large image. With text kept to a minimum, and photos taking up 50 percent of the window at any given time, the visual experience keeps readers engaged the whole way through. Note how the organization is able to minimize text by linking out to other webpages for more information. Each of these frames, for instance, links out to supporter’s actual campaign pages with more details. An online annual report gives you the freedom to provide tons of information while still packaging your most important points into a digestible format. 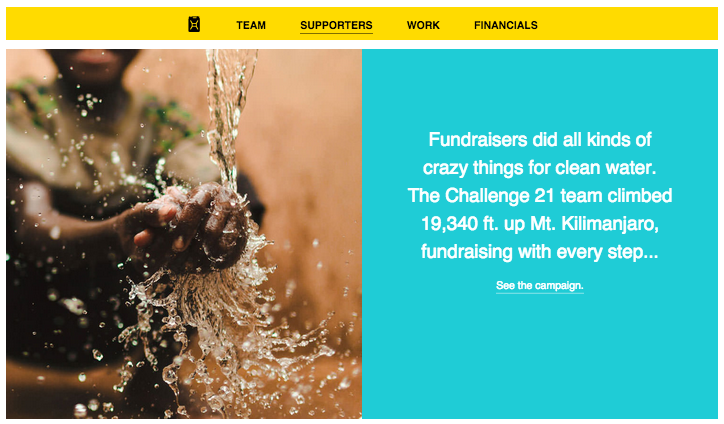 As demonstrated by these examples, another way to make your nonprofit annual report compelling and digestible is to include lots of visuals. After all, humans digest visual content 60,000 times faster than text. For instance, consider breaking down your stats with eye-catching charts or graphics. Pencils of Promise uses colorful diagrams and bold numbers to relay their numbers and progress. Visual storytelling also connects readers to the impact you’re making on an emotional level. Show the faces of those you’ve served, and display the projects you’ve completed. 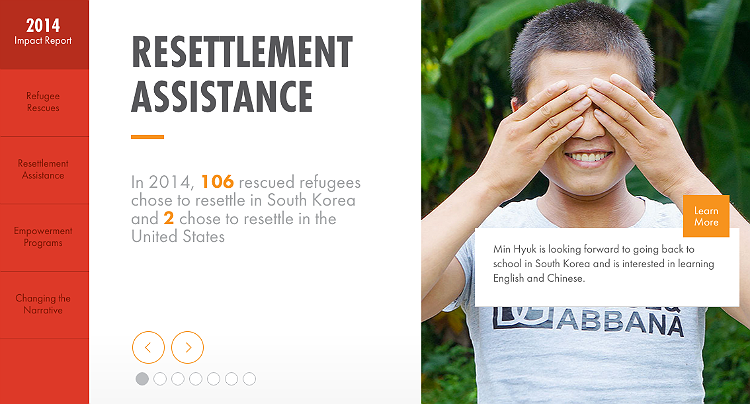 In their 2014 nonprofit annual report, Liberty in North Korea provides photos of constituents alongside the organization’s general updates. A short blurb on each photo shares a piece of the refugee’s narrative, while a call to action to “learn more” directs readers to their full story. As you scroll through for more program updates, each image updates with another beneficiary and introduction. This is an excellent way to make an annual report personal and emotionally compelling. One of the biggest pitfalls of nonprofit annual reports is that they’re just too long and hard to digest. With the average human’s attention span hovering at eight seconds, a report that reads like a novel will be hard for even the most devoted supporter to get through. Make sure your crucial updates and achievements stick with supporters by crafting an issue that’s scannable and easy to read. One way you can do this is by providing an executive summary. This is a one-pager, or shorter roundup of key takeaways from your report, so that readers can absorb your most important information without having to pore over your entire document. If you only had one page, what would you say? What information do readers really need to know? Then in the report you can elaborate from those points. 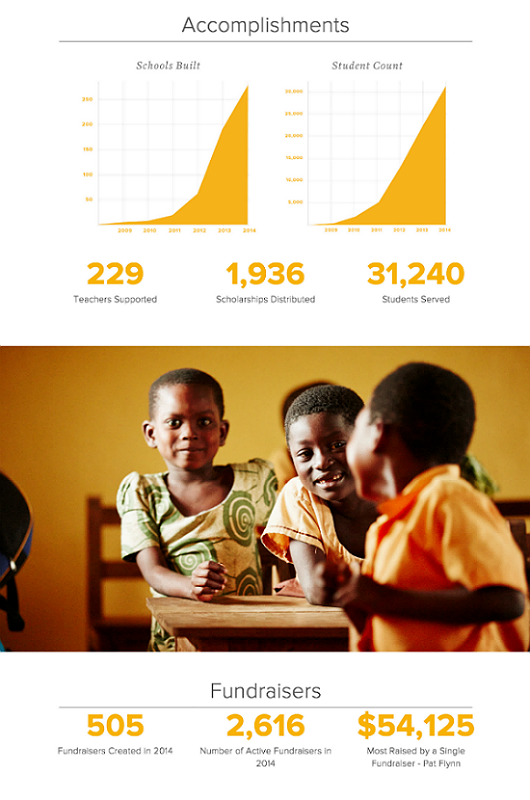 Pencils of Promise, for example, provides a short recap of their 2014 Annual Report on their website. They present their most important numbers here, like the number of lives impacted and amount raised by individual fundraisers. Not only is this summary short and sweet, but it also compels readers with large, high-quality photos as they scroll down, frame by frame. The organization provides a link to the full report at the top of the page. 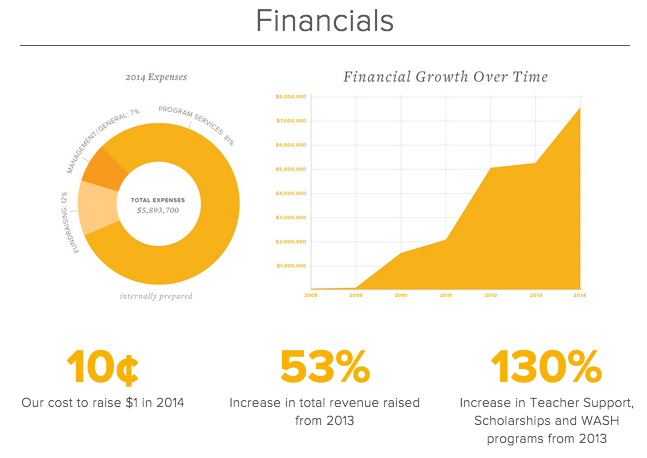 Kick your next nonprofit annual report up a notch. When you make it a beautiful and visual experience that’s easy to read, you can encourage supporters to stay engaged, gain a greater understanding of your accomplishments, and get inspired to make your next year an even greater one.